Olaplex is not a conditioning treatment. Nothing like it has ever been used in the hair industry and to say that it is a game-changer is not an exaggeration. 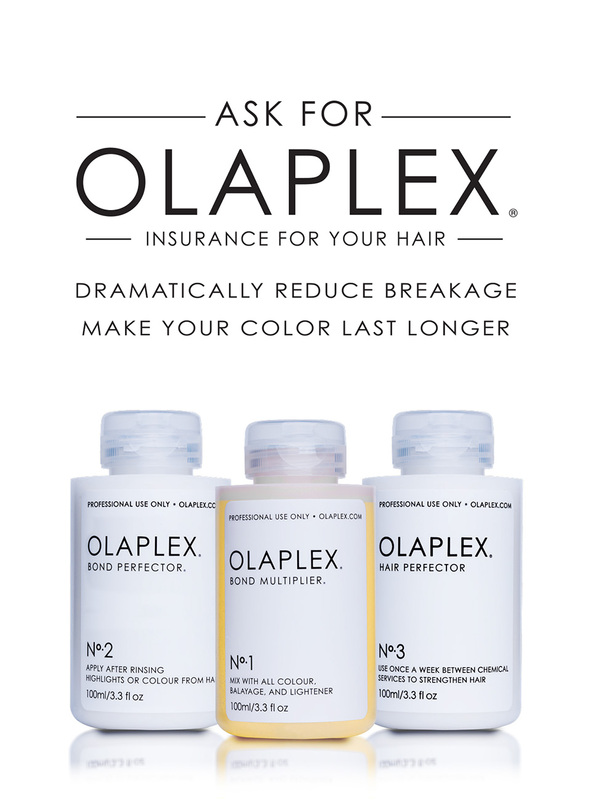 Olaplex is a bond multiplier that contains a single active ingredient, Bis-Aminopropyl Diglycol Dimaleate. It is a completely new technology, released only in the last year or so, that treats the hair from the inside. Damage to our hair is done every day. 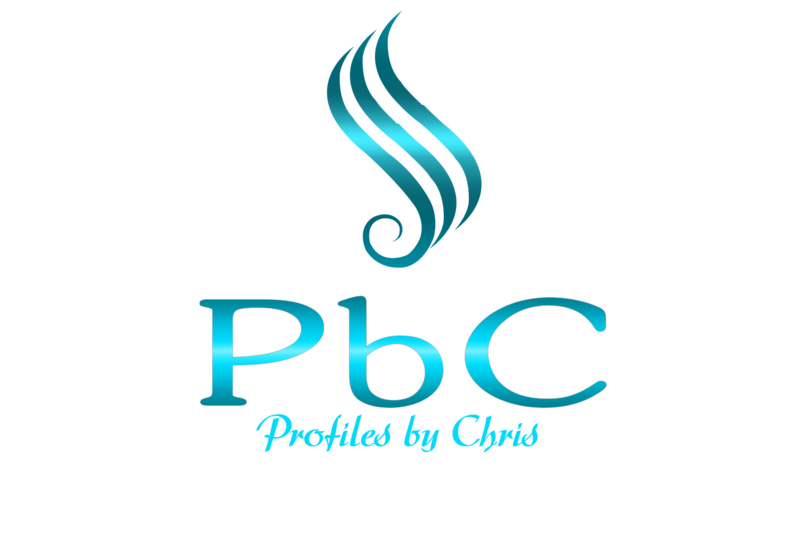 Disulfide bonds within our hair strands are broken every time we color, perm, straighten, curl and even brush our hair. The more bonds that have been broken into single hydrogen sulfur bonds, the more damaged our hair is, resulting in breakage and color fade. Olaplex works by finding the single bonds that have been broken during chemical processing and thermal and mechanical styling and cross linking them back together to re-form disulfide bonds. Olaplex is the only product of its kind with 8 worldwide patents publishing soon. It is free of silicone, sulfates, phthalates, DEA, aldehydes, and is never tested on animals. It can be incorporated into your hair color mixture or used in conjunction with a perm or relaxer to dramatically reduce chemical damage. It can even used before a Brazilian Blowout to increase the internal strength of the hair prior to the service. As a stand-alone repairing treatment, Olaplex is unparalleled in strengthening hair and reversing previous chemical and mechanical damage. It can be used as often as needed as it is not protein based and will not make the hair brittle. 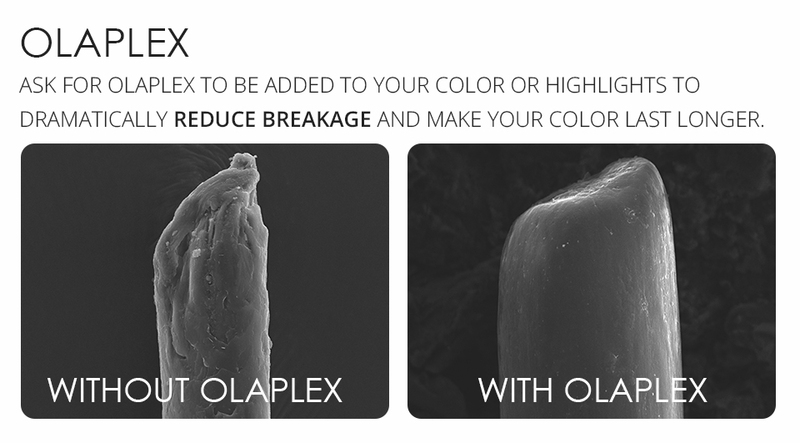 The Olaplex #3 is a treatment you can take home. It is recommended to use #3 once a week as maintenance for healthy hair. For damaged hair, it can be used 2-3 times a week in combination with your favorite moisture and protein products. Bonds are broken via thermal, mechanical and chemical services on a daily basis. By using No.3 or doing a full stand alone treatment first, you can restore the integrity of the hair to the point at which a service would then be possible without significant damage.